Don’t touch that dial! Or that remote. Researchers have worked out a way to use gestures to control your home devices using the Wi-Fi network and an embedded receiver in your router. It seems I’m not the only one obsessed with new user interfaces for controlling the internet of things. 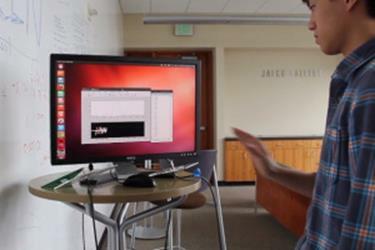 Four researchers at the University of Washington have unveiled their research using Wi-Fi to build out a gesture-based interface for connected devices in the home. They call it WiSee. The technology would be embedded in a Wi-Fi device, like a router or access point and would figure out the motions someone was making based on how those motions affected the Wi-Fi network. For those who don’t think about the electromagnetic radiation Wi-Fi produces (that’d be most of us) it’s important to realize that Wi-Fi is sending out a steady array of signals that bounce and bump into things into your home. If you could see the airwaves in the 2.4 GHz or 5 GHz band you’d see that every move results in a ripple effect, like a type of radar system. Normally those ripples are too small to be detected, but the WiSee researchers have discovered algorithms that help amply the Doppler effect created by a gesture disturbing a Wi-Fi network. It then can translate that difference into one of nine corresponding gestures with 94 percent accuracy rate. Check out the video above and for those who have read the Hitchhiker’s Guide to the Galaxy feel free to recollect Zaphod’s challenges in getting the radio in the Heart of Gold tuned to a specific station and stay there. For those who have missed the book, he basically has to stay very still. Over a 24-hour period, WiSee’s average false positive rate—events that detect a gesture in the absence of the target human—is 2.63 events per hour when using a preamble with two gesture repetitions. This goes down to 0.07 events per hour, when the number of repetitions is increased to four. The technology differentiates from different people in the room by using MIMO, an antenna technology that relies on multiple antennas on a device and at an access point that essentially identifies and tracks the “target user.” The paper notes that the WiSee receiver can identify the correct person as the target 90 percent of the time in a room of three people.